Aerospace GAMES campers watch a model aircraft in flight. 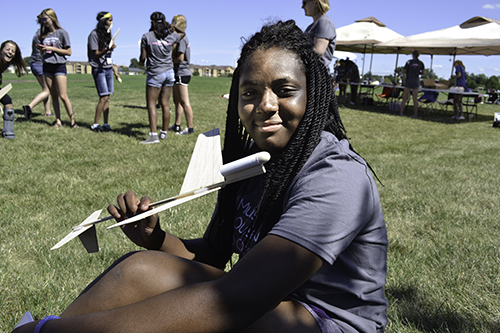 Twenty-seven high school girls were at Dodds Park on Friday July 14th to launch the glider or the rocket each had built during Aerospace GAMES camp. Eyes glued to their aircraft’s trajectory, some experienced the thrill of victory as it soared in a picture-perfect flight, while others experienced the agony of defeat as their aircraft flew erratically because of a faulty design, or flew briefly then plummeted to the ground when it lost a crucial part. But despite the performance of their aircrafts, the students learned a lot about aerospace during the week-long camp from July 9–15th. They not only learned some principles of flight, and were exposed to possible careers in the field, but, most importantly, they interacted with a number of role models—women either in aerospace careers or preparing for them. Brian Woodard (center) and several Aerospace GAMEs students watch as a student launches a rocket during the Rocket Propulsion session. 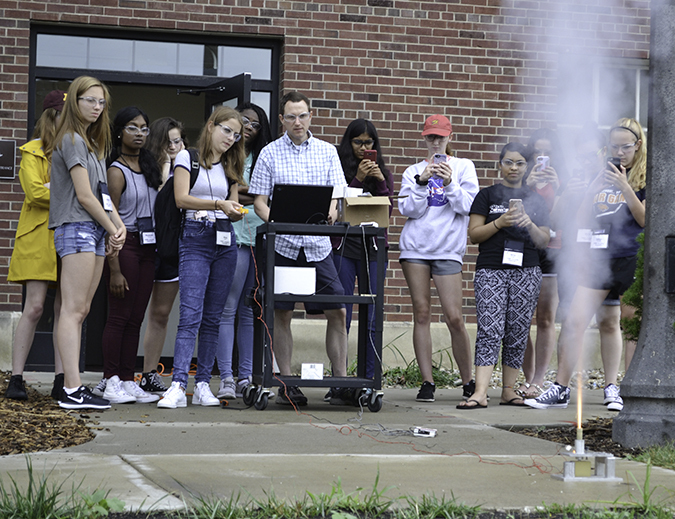 In its sixth year, the Aerospace GAMES (Girls' Adventures in Mathematics, Engineering, & Science) camp for high school girls employed a curriculum the camp’s director, Brian Woodard, developed and tweaks a bit every year. But while the highlight of the camp was building and launching a model airplane andl rocket, before doing so, the girls first needed to learn some physics—the principles of flight—and about aircraft design. So first, the students learned some of the many important baseline principles about aerospace: aerodynamics, rocket propulsion, flight mechanics, orbits, structures and materials, and missions. During a number of sessions, the girls participated in the camp’s major hands-on projects—designing and building their own model glider and model rocket, which the girls then got to test during the Friday launch event. A camper flying a simulator gets some direction from one of the instructors. A camper flying a flight simulator at the Institute of Aviation. Students also visited an aerospace-related campus lab, Talbot’s Wind Tunnel Lab, and took a field trip to Willard Airport to the Institute of Aviation run by Parkland College. There students got to find out what flying is like using aircraft flight simulators, took a behind-the-scenes tour of the control tower, plus got a ride on the fire truck. In addition, to serve as role models for the campers and to give them a glimpse into what a career in aerospace might be like, a number of Illinois alumnae served as guest speakers, several via Skype. For instance, Joanie Stupik, who got her Master’s degree in aerospace engineering at Illinois and currently works at NASA’s Jet Propulsion Laboratory in Pasadena, California, called in and talked to the students for 45 minutes, answering a lot of their questions as she shared about her work on the Cassini mission that’s studying Saturn. Other women who shared with the girls were Julia Laystrom-Woodard from CU Aerospace; Heather Arneson from the NASA Ames Research Center; and Melanie Ciancio from Northrop-Grumman, a global security company providing technologies for undersea, outer space, and cyberspace applications. Cassandra Dickey, an Illinois Aerospace senior (right) gives a camper some pointers about her glider. According to Woodard, he and his team also worked hard to “get good role models for all these young students from our department.” Helping out with the camp were two undergrads and a graduate student who helped him run the program. And in a major coup, Woodard and company were “actually really lucky,” when they got some unexpected help: a student who had helped him run the camp for several years in a row, Laura Richardson, who had “graduated, and gotten a real job, like they do,” had volunteered her time to come back and work with the camp again for the week. Also a plus, according to Woodard, the two Illinois undergrads are really involved with a number of student projects which they shared about with the campers throughout the week. This was relevant because some of these student projects—which involve building model airplanes, robots, or rockets—were things the girls might want to try their hand at during the first semester of their freshman year at Illinois, should they decide to come here. “They can get involved with those things right away,” he says. Aerospace GAMES campers test their gliders the final day before the big launch event. “It seems to be paying off,” he says, while acknowledging that, “It's hard to correlate exactly one-to-one that the GAMES camp has been the only cause, but we've seen, in the last few years, an uptick in the number of women in our program,” he continues. An Aerospace GAMES camper building her glider. Campers watch a model aircraft in flight. Aerospace GAMES camper, Ahriel Tyson, shows off her finished product. One of those who might is Ahriel Tyson, a high school sophomore, from Palos Heights, Illinois. She hopes to be an astronaut one day and has “always been interested in aerodynamics and things like that.” In an effort to achieve her career goals, Tyson hopes to gain insight into the field early on. What did she learn at the camp? “Rocket science is as hard as they say it is!” Determined to pursue her career goal of becoming an astronaut, however, she admits, “I like the challenge that it poses on me.” Tyson acknowledges some of the obstacles she will have to overcome with regards to coursework needed to go into aerodynamic engineering. For example, according to Ahriel, “I definitely need to get into calculus. I know that for a fact.” Tyson has the University of Illinois within her list of top choices for college. Harriet Hunt prepares to launch the glider she built. Aerospace GAMES campers, and a possible future GAMES camper, Brian Woodard's daughter, who was enjoying the festivities. Aerospace GAMES camp director Brian Woodard (center) and some campers ignite a rocket during the Rocket Propulsion session.